I finally got my own time. Most reviews say that the EeePC is good and I can just easily agree to that. From a scale of 1 to 10, 10 being the highest, it’s an easy 15. No kidding. It’s really a good kinda net. The price is so right. It’s not much of a powerhouse of a notebook but even if it is that cheap, it still boasts a lot of good stuff within it. Quick start-up? Check. Quick shut down? Check. It can start-up and shut down almost twice as fast as other devices of the like. The EeePC is really very portable. Lightweight, less than 1kg. The kind of notebook you can easily bring anywhere you want. The notebook has more than 40 learn, work, and play tools pre-installed. It’s really worth the price. The built-in camera also has a good resolution and can take decent pictures. Speakers sound good. None of those scratching noise crap. And It’s built-in. Another bonus. Connectivity is not an issue. LAN is plug-and-play. Wireless connectivity is out of the question, too. It can find wireless networks easily and can connect just as easily. The screen might be small at 7 inches but most computer users can deal. Resolution’s got two options. You can go for 800 x 600 or you can choose 800 x 480. It’s not that 800 x 480 does not fill up the whole screen, it does With 800 x 600, the screen is scrollable. But mostly you’ll go for 800 x 480. Ports include 3 USB ports, 1 port for the microphone, 1 port for external speakers or headsets, 1 memory card slot / reader and the DC port. 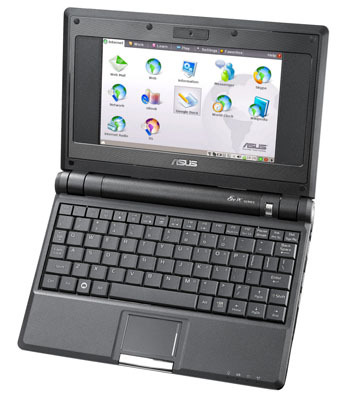 Battery life is as good as the official Asus EeePC website says – it can last for 2 – 3 hours or so depending on whatever you’re doing. Compatibility to some programs is not an issue, too. If you can’t work well with Linux, you can install Windows XP. The only downside I can see is that mostly the available ones are the 4G models. After installing Windows XP, Microsoft Office and Mozilla Firefox only about 800 mB was left. Mostly I can say, in a scale of 1 to 10, 10 being th highest, it is an easy 15. Yeah, I was too ecstatic the last time to give some more words. Now I’ma post more ’bout the EeePC. And still this time I’m posting from a hotspot. Guys from the apartment unit interrupted. I’ma give the filler next time.